Final election results will now be announced on 8 July - a month later than planned, the National Election Board Ethiopia says. This will allow election authorities to investigate hundreds of alleged episodes of fraud and vote rigging. Opposition parties have vowed to stage mass protests if the provisional results are validated. The opposition have, however, won almost 200 seats - a huge gain from the 12 they had in the previous parliament. EU observers have voiced concern over irregular vote counting and biased reports by the state-owned media. 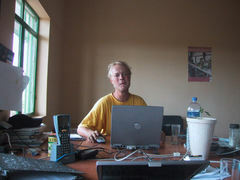 Verder lezen/Read more Final election results in Ethiopia posponed till july. In the middle of nowhere, Marc Driessen from the Netherlands, set up his flower farm Maranque Plants PLC in Ethiopia. It is an amazing view. Last year there was nothing and this year one can see two greenhouses of 10.000 square meter and all required infrastructure like water irrigation facilities, climate control equipment, a working hall with a cold storage, offices and even a beautiful house where Marc and Niels Prinssen, his (Dutch) manager, will live. 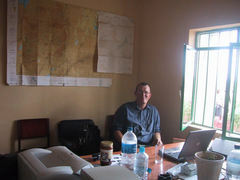 Niels Prinssen and Marc Driessen in their office. Verder lezen/Read more Flower Farm Beekenkamp-Maranque in Ethiopia. 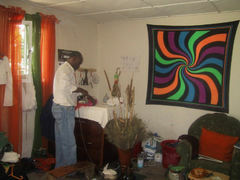 I paid a visit to Fashion Design A AIP in Addis Abeba. As you can see in the photo's below I was their top-model for one day. A.AIP is a creation of Mekdes and her friends. 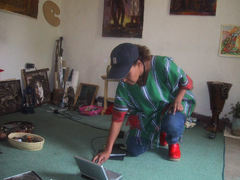 She makes beautiful clothes and is, at this moment, busy setting up a business in Addis. Mekdes can be contacted through the Safari Lodge in Nazret, tel 02-122011. Verder lezen/Read more Fashion Design A AIP in Addis Abeba. 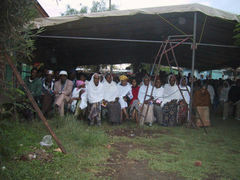 Here are some photo's of the election day in Ethiopia on the 15th of May. 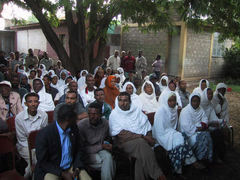 Many people in Ethiopia came to the polling stations. It was a very exciting day. Information about the results can be found on the site of the National Electoral Board of Ethiopia. Verder lezen/Read more Election Day in Ethiopia. On the 15th of May the people in Ethiopia can elect a new parliament. The European Union is sending 100 short term observers and 50 long term observers to Ethiopia. I am one of the long term observers and will be in Ethiopia from the 15th of April till the 15th of June. On my site you can read about my whereabouts in Ethiopia. Verder lezen/Read more EU Election Observation Mission- Ethiopia 2005.